What moments matter to you? Is it when you’re gathered with family, sharing a meal and conversation? Or maybe it’s at work, when you’re knee-deep in a project you’re excited about. On a recent Monday, I found myself with some rare downtime. I put the baby down for a nap and took Dorothy, my 2-year-old, out on the porch. We sat in the morning sun, singing songs and playing together. It was calm and peaceful. These are the kinds of moments that matter to me, so I do my very best to step into them, to work toward them and be fully present when they come along. 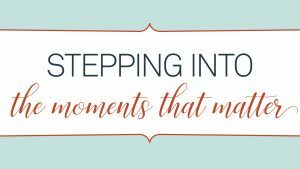 I recently read a phrase—step into the moments that matter—and it’s stuck with me. So often I hear from those who, for whatever reason, are motionless to move toward theirs. They know what matters to them. They’ve identified what would make them happier, but they’re struggling to step into it. If that’s you, worry not. You’re just three steps from getting there. Fear and ego are generally our biggest, self-built roadblocks when it comes to stepping into our moments. For example, one of my clients set a goal for herself earlier this year: to quit her job before summer arrived. She thrives when she’s home with her son, and she wanted to spend the warmer months together. Summer came, and she stayed put. She had plenty of valid excuses: There were crises at work. Her son was at camp. She wouldn’t even see him much anyway. But it all came back to her fear and ego. How would her coworkers fare without her? How would it look to others if she gave up her job? Could she free herself from the golden handcuffs? The answers to these questions rarely matter, but when you examine why you’re asking them in the first place, you can start to make progress. When you’re aware of what’s holding you back, you can start planning ways to break free. A newer client of mine is at a particularly tricky crossroads. Her job, one she’s had for 16 years, is stealing her joy. She feels tired and irritable, with little time to enjoy life. She’s being pushed to relocate, a move she doesn’t want to make, but she’s the breadwinner and has a responsibility to financially care for her family. We’ve talked through her fear barriers and identified a few paths she’s comfortable with that will help her step into her moment. Now she’s examining her options and laying the groundwork for what she’ll do next—a crucial stage of the process. Use your fear to light your fire. You’ve identified the moments you want more of, acknowledged the fears keeping you from them and put plans in place to move forward. But you’re still scared. Guess what? That’s normal, even healthy. The healthy kind of fear—the kind that doesn’t keep you frozen—is a weapon you can use to propel you forward. Another acquaintance of mine is on the cusp of starting her own business as a health coach. It’s been a side hustle for years, and she’s earned all of the necessary credentials, plus worked full time at an accounting firm to support it. She’s nervous about taking that last step and officially walking away from her 9-to-5, but her nerves are secondary to her excitement. It’s never easy to make a life-altering decision. But when you’ve worked through each phase, you can confidently position yourself to be exactly where you want to be, so that you can create moments worth living for—and then really step into them. Do you struggle to step into moments that matter to you? I’m an executive coach who helps clients nationwide with personal and professional development. You can reach me at regan@reganwalsh.com. 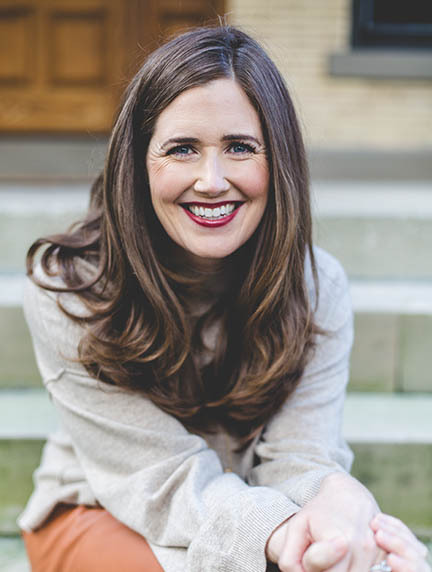 Whitney Johnson, a management coach I admire, recently sent a message out to her network, inviting us to a dinner party in New York City doubling as a mastermind group. I immediately said yes. The idea was to gather people with diverse backgrounds so we could mingle, share advice, and build community. The lure of meeting Whitney and others in her circle was electrifying to me, but I found myself strangely anxious on the way to dinner. As traffic inched along, I felt self-doubt weasel its way in. Would I be enough? Did I have something worthwhile to contribute? I let myself feel uncomfortable and powered through. We played a business version of a speed dating game, sharing fast facts and asking for advice as we went around the room. We talked about life balance, cancer diagnoses, starting a business, and so much more. I left energized, with a full heart—and with a few promising professional leads, too. 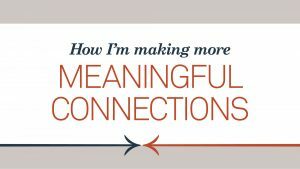 Building meaningful connections like these has been an important theme throughout my 2017. I’ve been intentional about when and how I reach out to others in an effort to ask for or offer professional help, and that’s produced some wonderful results. But it’s required me to overcome a good dose of anxiety, discomfort, and uncertainty—and it may for you, too. I take a sincere interest in what matters to them. I remember details, follow up and help them if I can. I hold them accountable and ask them to do the same for me. We all appreciate feeling heard. I show up for myself and am vulnerable. Though it often requires a dose of courage, I ask for help if I want it. I admit failure, and I share successes, which is often surprisingly more difficult than the former. Vulnerability makes us relatable. I make time. There will always be an excuse not to do something if you need it. (Did you read that New York Times article about bailing?) Life is busy. But when I’m committed to building a deeper relationship with someone, I consciously set aside time for them. We can’t build a thing if we aren’t present to do it. Do you need to be more intentional in your life and work? I’m an executive coach who helps clients nationwide with personal and professional development. You can reach me at regan@reganwalsh.com.